If you are mad about betting and mad about supporting Australian bookmakers then MadBookie could be just what you are looking for. If you are reading this you are obviously considering opening an account with MadBookie and luckily for you, you are in the right place. You will find everything you need to know, both good and bad, in our in depth and impartial MadBookie review. 100% Aussie owned and run and geared towards Australian punters. MadBookie is a betting company run by Aussies for Aussies. 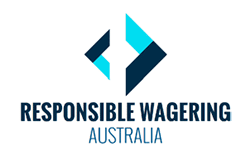 The only currency supported on their site are Australian dollars and wagers are only accepted from customers based in Australia and New Zealand. MadBookie was founded in 2015 in Melbourne and in 2017 TopBetta acquired the MadBookie brand. At the time of the TopBetta deal Melbourne based MadBookie boasted over 15,000 members and had a turnover of $80 million a year. They are licensed in the Northern Territory and the current MadBookie MD is Brett Luntz. MadBookie offers punters the opportunity to bet on Australian and International horse, greyhound and harness racing. They also provide a wide range of betting options on sports, and they are approved betting providers for the AFL, NRL, Tennis Australia, Australia Rugby and Racing Victoria. With wagering available on elections too, MadBookie is a betting agency that is well worth checking out. The most common way Aussie bookmakers attract new customers is by offering a sign up bonus. MadBookie offer to match your first deposit with a bonus bet, up to a maximum bonus of $100. Residents of SA, WA, NSW and VIC do not qualify for this sign up bonus due to local laws. Funds must be turned over twice on Bonus Bet selections at odds of $1.50 or greater per $1 bet for the Bonus, on any market eligible for a Bonus and any Winnings from the Bonus. Until turnover requirements are met you cannot withdraw any funds accrued from Bonus Bets. Find out how to get your MadBookie sign up bonus below. Make your first deposit and it will be matched with a bonus bet. (maximum bonus $100). Your account will instantly be credited with $100 in bonus bets. You can use your bonus bets on racing or any other qualifying sporting event (min odds 1.5). Offer not available to residents of NSW, VIC, WA and SA. * Other terms and conditions apply see MadBookie site for details. Once a bookie persuades you to open an account they usually run regular promotions to keep customers coming back. MadBookie are no different in this regard, and the range of promotions on offer is impressive. They place a huge emphasis on how proud they are to be 100% Aussie owned and run, and this is reflected in their patriotic promotions. However, don't expect too much of variety when it comes to promotions. That being said, the promos are updated regularly, but there usually isn't that big of an array of offers on the menu. Then again, this does not include any loyalty offers you might get. 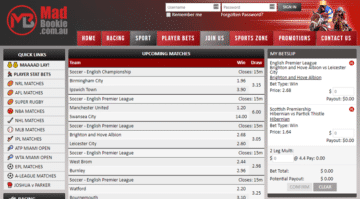 Bookmakers are always looking for unique ways to enhance their client’s gambling experience. MadBookie have introduced a product called Player Bets and this innovative tool allows punters to build their own bet on any player market. As MadBookie say themselves, ‘Player Bets allows a level of betting personalisation and customisation never seen anywhere else in the online wagering space’. To find out more about MadBookie Player Bets check out our fool proof guide below. Click on the ‘Player Bets’ button on the top menu bar. Choose your sport (NRL, AFL or NBA). Select your player or players from the list. Choose the statistic you want to bet on (e.g. for AFL disposals, tackles or goals). Choose the least amount of disposals/tackles/goals you think the player will achieve. If you are happy with the odds on offer add to bet slip and confirm your stake. Player head to heads can also be wagered on and multis can be created. Bonus bets cannot be used for MadBookie Player Bets. At the time of writing the MadBookie Sports Zone was unavailable. There is still a link in the top menu bar, but when clicked on you are brought to a page that states ‘Sports Zone is currently being updated and will be back online soon’. Here at Aussiebet we will be updating our bookmaker reviews regularly and if the situation with Mad Bookie’s Sports Zone changes you will be the first to know. Due to the Interactive Gambling Act Aussie bookies are unable to offer online in-play or live betting. However, with MadBookie you can still bet in-play by simply picking up the phone and dialling 1800 623 238. A MadBookie operator will take your call and will quote you odds on your in-play bet. Unlike most other bookmakers we reviewed, MadBookie do not display in-play odds on their site. Also, there is no information regarding the eligible sports for in-play betting that we could find. Check out our how to bet in-play with MadBookie guide below. Open an account with MadBookie. Call 1800 623 238 and ask the MadBookie operator for a price on your in-play selection. Lots of Aussie betting companies are offering live streaming of certain sporting and racing events right now. However, at this moment in time MadBookie do not offer live streaming in any shape or form. If this changes in the future we will let you know. Here at AussieBet we regularly update our bookie reviews so make sure to keep an eye on this page for the latest on MadBookie Live Streaming. These days betting on the move is becoming extremely popular with Aussie punters. Every betting agency we reviewed has had a Mobile App or Web App and all devices are catered for by MadBookie. For Apple iPod/iPad/iPod Touch users the MadBookie App is available to download free from the App Store. It is 30.4 MB, it requires iOS 8.0 or later and age restrictions apply. 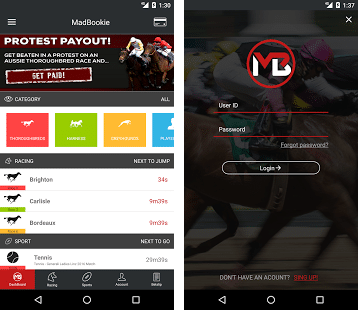 If you use an Android device the App is available via a link on the MadBookie website. If you use another type of device (Blackberry, Nokia, Windows Phone) then simply visit MadBookie on your device and you will be redirected to the MadBookie Web App. The App is designed well and it is very easy to navigate. It works smoothly and there are quick links to ‘Next Jump’ for racing and ‘Next Sport’ which will take you to the latest upcoming sporting events. All the usual markets are available, the odds refresh regularly and overall the MadBookie Mobile App is basic but it stands up to scrutiny. IMPORTANT: The mobile webpage looks bad, BUT the native odds are really great, so go for them. How Good Are MadBookie Odds? Sign up bonuses, promotions and special offers are all well and good, but perhaps the most important thing to consider when opening a new bookie account is quality of odds. Value is king when it comes to betting and we looked the odds on offer from MadBookie for an AFL fixture between West Coast and Sydney Swans and then compared them to some of their industry rivals. In the head to head market MadBookie had an over-round of 104.72% and that is about average. CrownBet had a slightly worse over-round of 104.76%, while Bet365 were best with 103.78%. However, for depth of markets MadBookie (13) was outperformed by both CrownBet (258) and Bet365 (111). 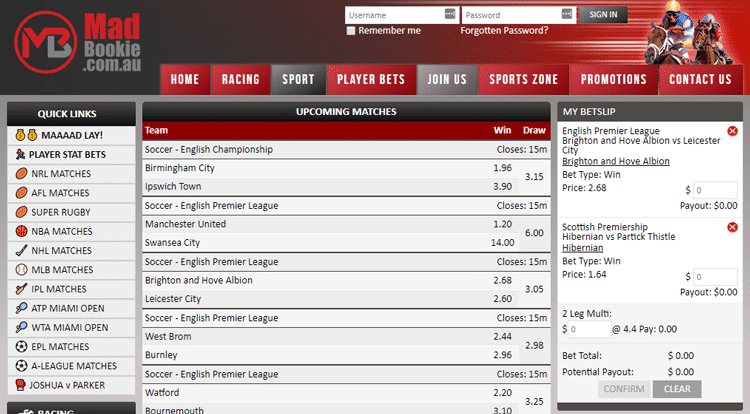 However, this is deceptive as MadBookie customers can use the ‘Player Bets’ option and that has a multitude of markets. Overall, MadBookie are very competitive when it comes to odds and markets, especially on Aussie sports. Unlike a lot of their industry rivals MadBookie do not offer a cash out facility. This is a service that has rocketed in popularity down under and sometimes it can be an absolute life saver, especially if you are sweating on the last leg of a mega multi. We update our bookie reviews with any new developments, and if MadBookie Cash Out does come online, you will find out about it at AussieBet first. Horse racing is a sport that captures the imagination of the Aussie Public and the country grinds to a halt every year for the Melbourne Cup. For those who concentrate on horse racing betting, MadBookie is worth a shot. Markets are available on domestic and international thoroughbred racing and you can place single win, place or each way bets. Mad Bookie also offer Best of 3 Totes for Win wagers and Mid Tote for place bets. For greyhounds and harness racing you will often see Win Tote +5%. You can also place Top Fluc, Best Tote, Best Of The Best, Best of Two Totes and Middle Tote wagers. You can also place multi bets and exotics on horse racing with Mad Bookie, including Quinellas, Exactas, Trifectas, Quadrellas and First Four wagers. Just like with their sports betting offering MadBookie are about average for odds. They run some decent promotions for horse racing and you can find out more about them below. Non-Instant Deposit Methods: BPAY, Bank EFT. The amount of banking options available with your prospective betting company should always be at the forefront of your thoughts. MadBookie is an Australian company geared towards Australians, and as a result, their deposit and withdrawal options are rather limited. Credit/debit cards are the only instant deposit methods available, while Bank EFT’s are the only withdrawal option. This is an inconvenience for customers based outside Australia, but for Aussies the banking facilities do just fine. Before you can withdraw funds your MadBookie account must be verified and you can find out how to do that below. When you open an account with MadBookie they will attempt to verify your details electronically. If MadBookie cannot verify your details electronically, including but not limited to verifying your age or identity (which we are legally obliged to verify), they will contact you and ask you to provide further information to them directly. Accounts not verified within 45 days of opening will be suspended. No funds will be made available until the verification process has been completed. A copy of your credit/debit card must be provided for verification purposes. Top Fluc/Best Tote/Best of Best/Best of 2 Totes/Middle Tote: $101. *Please check MadBookie Terms and Conditions other limits may apply. We place huge importance on the quality of customer service when compiling our bookie reviews and MadBookie scores very well in this department. They have a reputation for providing prompt and polite customer service and you can find out MadBookie’s main contact details below. Telephone: 1800 623 266 (Sun-Thurs 9am-10pm AEST; Fri/Sat 9am-11pm AEST). Post: MadBookie, 501 Church Street, Richmond, VIC, 3121. Live chat: Available during same hours as phone help and when offline you can leave a message that will be answered as soon as an operator is online. Is MadBookie A Bookmaker You Can Trust? Protection of passwords using industry standard encryption. Measures to preserve system security and prevent unauthorised access. Back-up systems to prevent accidental or malicious loss of data. Any paper copies are stored in locked cabinets or restricted access archive rooms. Another area we like to see bookmakers take seriously is the promotion of responsible gambling. MadBookie do not let themselves down in this department. Mad Bookie is committed to provide a responsible gambling service, where clients have access to online tools so they can exclude themselves or limit their betting activities. MadBookie betting operations are governed by this policy and a code of practice. Below are some of the facilities MadBookie have put in place to combat problem gambling. A 7 day window applies to clients who request for the flag to be removed. Providing Responsible Gambling information and messages to clients. Staff receive frequent Responsible Gambling training. Referring clients who are at risk of problem gambling to gambling-related support services. MadBookie: You’d Be Mad Not To Give Them A Try!!! In conclusion, we were pretty impressed by what MadBookie has to offer. Of course, there are negatives as well as positives, but that is the case with the vast majority of bookmakers we have reviewed. The negatives for MadBookie include limited banking facilities, lack of streaming services and no in-play odds advertised online. However, on the plus side, we found that their odds are very competitive, their customer service and responsible approach to gambling is second to none and their Player Bets product is an innovative and original idea that adds to the overall gambling experience. Best of all, MadBookie is owned and run by Aussies for Aussies, so for patriotic punters MadBookie is a betting agency that is worth taking a chance on.